1 ¼” colored panel nails (over drywall). Subfloor adhesive may also be used. 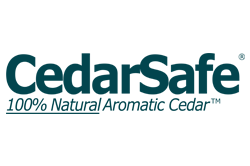 Note: Before you install cedar panels, you’ll want them to acclimate in or near the area they will be installed for 24-48 hours prior to installation. This will allow the wood to expand and contract (due to heat and moisture changes) as needed in its new environment. Clear walls of nails, hooks, shelf brackets, etc. Walls should be as smooth as possible. Separate the panels and allow them to acclimate for about 24 hours near the area where they will be installed. Leave at least 1/8″ space between each panel, the floor and the ceiling. The 1/8″ spacing will allow for the natural expansion of the panels. Using 1-1/4″ panel nails, space nails 6″ apart on panel edges and 12″ apart in center, nailing panel from left to right. Install Giles & Kendall cedar molding for a professional finish. Do not seal, stain, or varnish. Have you found a unique way to use your paneling that we should know about? What about a helpful installation tip? Show the world! Contact us today to show us what you did!